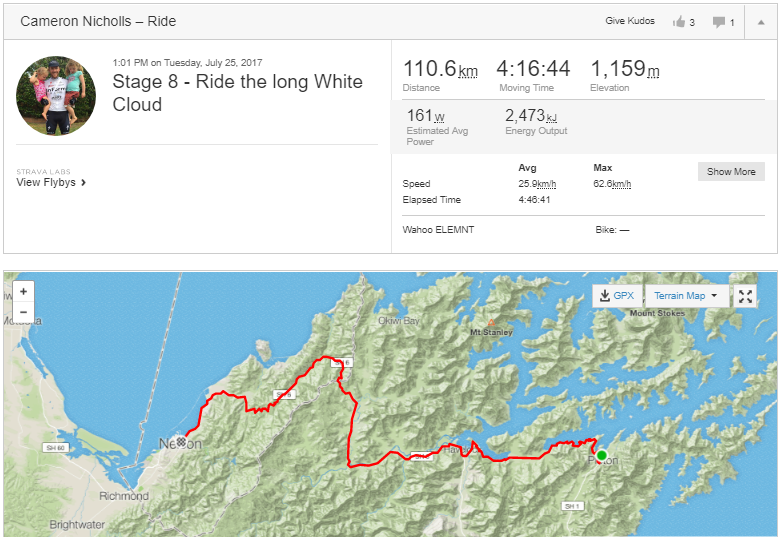 Today was day 8 of Ride the Long White Cloud and day 1 on the South Island. Cam went from Wellington on the North Island to Nelson on the South Island, helped some of the way by the Interislander ferry. We’re over half way through New Zealand and very close to hitting the mountainous West Coast. The next couple of days are likely to be much prettier and less dangerous than those few days riding down Highway 1 on the North Island. Over to Cam for his daily report. As the sun rose over the Wellington hills I sat perched in front of the ferry to Picton on the South Island. I had to wait for the cars to load as bikes go last. I sat there on my companion reflecting on the past 6 days. I won’t deny, at times I’ve had doubt. 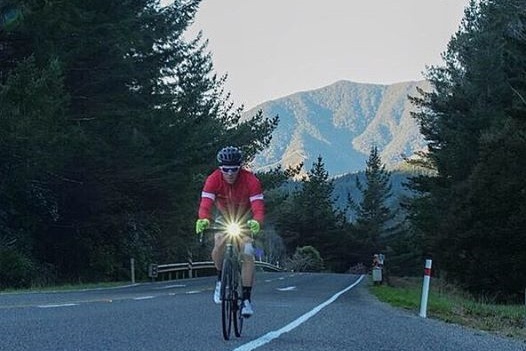 With an injury, which now has me limping off the bike, and extreme rain and nasty weather conditions I’ve wondered how I could get up the next day and ride another 200 km, from dawn till dark. 8 hours+ of lonely riding every day. Just me and my thoughts. Fatigue has set in and we’re now going deep together. The ache in my knee while lying causes a highly disrupted sleep, adding further woes to my ability to rest before another round of pedalling. But wedged more profoundly between the times of pain and doubt are moments of elation – like when I was kicking things off at Cape Reigna Lighthouse, watching two seas merge in incredibly harsh yet beautiful conditions. Riding through the Desert Road on a clear morning, with snow capped mountains in the background. Feeling the kindness of the New Zealand people throughout my journey on the North Island, and catching up with family. Last night was special, hanging with my cousins in Wellington. Yesterday my cousin Mark Latham booked me a massage, dropped me off and picked me up. He tinkered with my bike to fix a few niggles and then cooked a roast and made me my favourite chocolate cake. What a legend. South Island here we come. My wife Alice has been my one-person support crew on this journey and I must say she has been nothing but legendary. She’s been making my meals, booking hotels, unpacking and repacking cars, making my breakfast the night prior so I can leave nice and early; giving me a massage and rubbing her beloved doTERRA oils onto my knee! 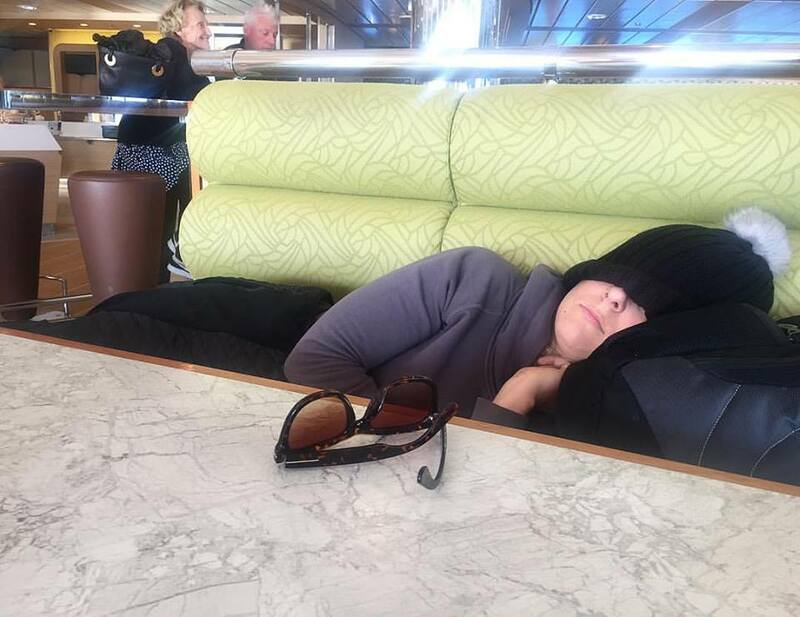 She definitely deserved a sleep on the ferry. Today’s ride was 110 km from Picton to Nelson. 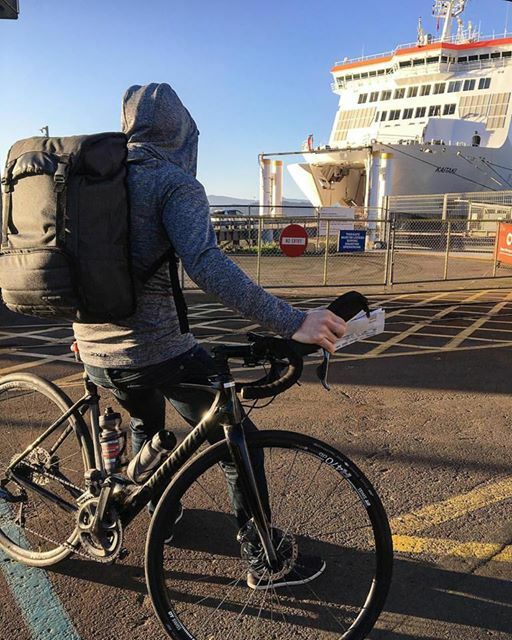 I started the ride in the afternoon as our ferry from the North Island docked around 1pm. It was 14 degrees and sunny so warm enough to take my leg warmers off – I couldn’t believe it! The terrain from Picton to Nelson was incredible. Winding through gullies and over mountains was phenomenal. As the sun was disappearing behind the mountains this afternoon I started to feel very small and vulnerable, surrounded by huge pine forests and untouched landscape. “I’m in a very different place now”, I was thinking. It’s still New Zealand but the conditions are vastly different to the North Island. I’m off Highway 1 for good now, although Highway 6 still has its fair share of mega trucks. Tomorrow we’re off to Reefton, 210 km down the road. Please don’t forget to check out the Ride the Long White Cloud campaign page for more info on Cam’s ride. Please make a donation to CanTeen New Zealand and Australia as you see fit. Any amount is greatly appreciated!